I appear to be doing these roughly weekly, and I'm going to try to continue with that. There are a lot of contradictions in this bunch. Let's start with the Clinton campaign. I told a friend a couple of weeks before the election that I felt really good about Clinton's chances based on the fact that the campaign appeared to be using a lot of the Obama strategy and infrastructure. However, I was viewing that from the bubble of the volunteer room at Brooklyn HQ and the Brooklyn field office, where, yes, it appeared we were doing things right between sending hundreds of people every weekend to canvass in Philly and making hundreds of thousands of calls to Florida. But the fact is that that I cannot speak for what the campaign was doing in Michigan and Wisconsin. FBI Director Jim Comey’s letter shifting late deciders, the lack of a compelling economic message, the apparent Russian hacking. But heartbroken and frustrated in-state battleground operatives worry that a lesson being missed is a simple one: Get the basics of campaigning right. The anecdotes are different but the narrative is the same across battlegrounds, where Democratic operatives lament a one-size-fits-all approach drawn entirely from pre-selected data — operatives spit out “the model, the model,” as they complain about it — guiding Mook’s decisions on field, television, everything else. That’s the same data operation, of course, that predicted Clinton would win the Iowa caucuses by 6 percentage points (she scraped by with two-tenths of a point), and that predicted she’d beat Bernie Sanders in Michigan (he won by 1.5 points). Now the Clinton campaign was not unique in its reliance on a “model” for understanding election dynamics. One of the big trends since 2012 among political practitioners and observers alike has been the gradual displacement of random-sample polling with models of the electorate based on voter-registration files, supplemented by tracking polls of this fixed universe of voters. This approach tends to create a more static view of the electorate and its views, and probably builds in a bias for thinking of campaigns as mechanical devices for hitting numerical “targets” of communications with voters who are already in your column. You could see this new conventional wisdom (and the pseudoscientific certainty it bred) in pre-election models published by Bloomberg Politics and in an Election Day modeling experiment conducted by Slate. Having invested heavily in its own “model” for what it needed to do when and where, the Clinton campaign was naturally resistant to conflicting signals from the ignoramuses on the ground. It is in that respect that just about everyone within and beyond the Clinton campaign erred in crediting it with a state-of-the-art “ground game” worth a point or two wherever it was deployed. Clinton had lots of field offices, to be sure. She had more money for get-out-the-vote operations. Team Clinton did much, much more targeted outreach to key voters in key states than did Team Trump. But in the end “Brooklyn’s” decisions were based on assumptions that had very little to do with actual developments on the “ground;” its hypersophisticated sensitivity to granular data about many millions of people made it fail to see and hear what was actually happening in the lead-up to the election. For now it probably doesn’t matter whether it was James Comey or the campaign’s faulty self-confidence that cost Clinton the election. But when it comes time to build the next presidential general-election campaign, the people setting up the organization and paying the bills might want to rely a bit less on any system that values analytical omniscience at the expense of a willingness to change the game plan if there are signs that that is needed. What all of this comes down to is that something very big happened in this election that was quite separate from Comey and Putin. Let's put a pin in that for a moment before we discuss what that 'something' was. These outside interventions (obviously of very different kinds) were something like the straw that broke the camel's back. I think it's quite likely that without them Clinton would have held on in a tight race. Perhaps the shift in Wisconsin would have been 6% or 6.5% rather than 7.7% The consequences of this defeat, which are frankly massive, would be vastly different. But the shifting politico-demographic shift would be only slightly less steep. If you believe in the integrity of our elections, American sovereignty and - yes, let's say it - the importance of the legitimacy of the Trump presidency, the Russian sabotage and influence campaign is hugely important. But if you can't distinguish between let's say the 1 or 2 percentage point shift caused by Russia and Comey, from the 5 or 6 or 7 percentage point shift that made that small shift so consequential, I really don't know how to help you. They're both extremely important, but for very different reasons. Back to bashing the Clinton campaign, in what appears to be John Judis's final postmortem, he calls the Clinton campaign "abysmal" and that they got outflanked. The Hillary Clinton camp continues to dwell on the fact that she won the popular vote by 2.8 million, even though she lost the electoral college. But Clinton spent twice as much on the election as Trump did, and spent money to drive up the vote in Chicago, New Orleans, and California. According to Politico, the Clinton campaign and the Democratic National Committee were actually worried that while Clinton would win the electoral college, Trump would win the popular vote. I do seem to remember Trump showing up in puzzling states like New Jersey down the stretch, so I don't think that she really got outflanked in that sense. She could've done better, but nearly everyone thought Wisconsin, Michigan, and Pennsylvania were in the bag, and there were plenty of calls for Hillary to expand the playing field (which she did, in making Arizona and Texas much closer than expected). FBI Director James Comey definitely hurt Clinton’s chances when he re-raised the issue of her emails on October 28, but he may not have cost her the election. If you look at the Los Angeles Times tracking poll, which proved to be the most accurate predictor of the results, Clinton had pulled even with Trump soon after the release of the NBC videotape showing Trump bragging about his sexual exploits, but Trump had begun to pull ahead again on October 26, two days before Comey stepped in. Data was clear that white noncollege voters were overrepresented in swing states, helping Trump in EC. Narrative-driven coverage ignored it. Ron Brownstein discussed how traditional energy impacted the votes of said white voters. Comparing the latest federal figures on states’ per capita carbon emissions with the 2016 election results produces a clear pattern. Trump carried all of the 22 states with the most per capita carbon emissions, except for New Mexico, and 27 of the top 32 in all. (Colorado, Illinois, Delaware, and Minnesota were the Clinton-voting exceptions.) The Democratic nominee won 15 of the 18 states with the lowest per capita emissions—with the exception of Florida, North Carolina, and Idaho. The Democrats’ challenge is that their coalition has crumbled in states that fear these changes, particularly in the Rustbelt, faster than it has coalesced in the states benefiting from them, which are mostly across the Sunbelt. To recapture the White House in four years, they’ll need recovery on both fronts. But the Democrats’ long-term prospects will likely rely on accelerating their leap across these overlapping economic, cultural, and energy divides. Though renewable sources are gaining ground in some Midwest states, Democrats face structural challenges in a preponderantly white and older region where manufacturing powered by low-cost, coal-generated electricity looms so large. More promising for them may be racially diversifying Sunbelt states that are also decoupling from fossil fuels as they shift toward both renewable energy sources and post-industrial employment. Already, Georgia, Arizona, North Carolina, and Florida rank in the bottom 20 states for carbon emissions. There might be something to it; I noticed driving through rural Ohio, Pennsylvania, and West Virginia today, I saw a number of billboards essentially saying that without fossil fuels, particularly coal, jobs there are gone, I don't know who paid for them. Could the Dems have put up billboards talking about bringing jobs to those areas? Should they have? -Hispanics and blacks were much more likely to have wanted to vote but found they were unable than whites. -Millennials were the most likely to have had to file a provisional ballot, followed by Gen X. Once again, how many were actually counted? In battleground states, particularly more diverse states, the percentage of white people voting Democrat decreases significantly as that population gets more diverse. So diversity is having an opposite impact that is harmful to Democrats. That’s why I argue to Democrats that you are going to lose more and more white votes, and unless there is a major party realignment, this is going to continue to be a phenomenon. As the Republican Party is seen more and more as the racial identification party for white people, you’re not gonna see us all of a sudden winning blue-collar white voters. So is there a way any of this — the strong influence of racial aversion and racial antagonism in politics — can be brought under control or stopped, or do we just have to wait for demographic changes that will make people who are motivated by racial antagonism less influential? I think the point I would argue it has to happen before demographic change — you already have people taking to the streets yelling they want to take our country back. What does that look like 10 years from now? What happens when that angry 45, 46 percent think they’re losing power, because they are losing power? We have to solve for this. But nobody has figured out how to solve for that, right? But we have to stop pretending that it doesn’t exist. That’s a start. I can see how pretending it doesn’t exist would be an important first step. It’s always strange to me to hear people say that Obama “triggered political polarization,” without explaining the race part. As if it’s a total mystery why that happened. One of the great tragedies is that the election of the first black president, as opposed to being a racial breakthrough, has in fact given rise to the opposite. It really has triggered an antagonism, or uncertainty, or fear that was dormant, at least up until now. When I told Obama that I thought Trump’s candidacy was an explicit reaction to the fact of a black president, he said he could see that, but then enumerated other explanations. When assessing Trump’s chances, he was direct: He couldn’t win. The talking point went around and we heard many quotes along those lines from Trump voters, as well as the one (which for some reason I can't find) about how Hillary talked to Latinos, blacks, and other minority groups, but not "regular Americans." 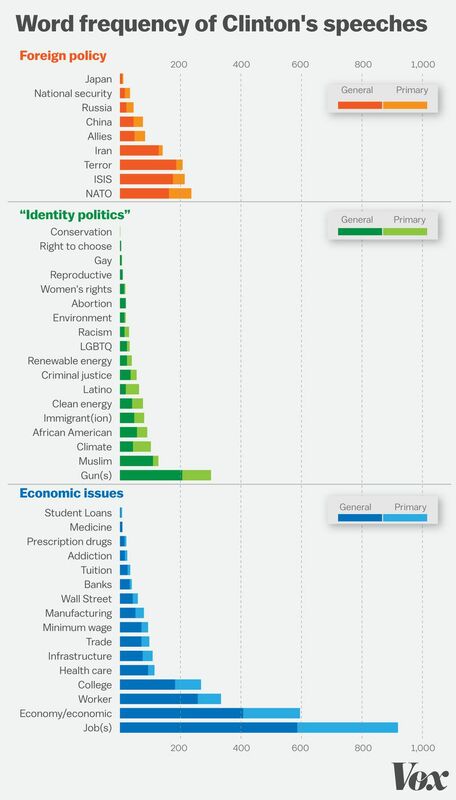 Put aside, for a moment, the notion that economic issues can be separated from identity politics (they cannot). Let’s focus on the critique of Clinton. It’s one I’ve heard so many times that I got curious: What did Clinton talk about? To find out, I gathered all her campaign speeches (from both the primary and general campaigns) into one document and did a simple word-frequency analysis. The results are below. As you can see, I’ve been as generous as possible in filing things under “identity politics.” Anything about minorities or criminal justice or gay people or immigrants, I filed as identity politics. I even included mentions of climate and clean energy in that category, though in a sane world those would be top-tier economic issues. So, without further ado, what did Hillary Clinton talk about? That bliie lin﻿e at the bottom that's three times as long as any others? "Jobs." So, this is another time where the numbers don't bear out the assertions. Still so much to unravel!